There are so many different types of saws out there. A table saw or sawbench is one that is mounted to an arbor and has a circular saw blade sticking through the surface of a table. Looking for the best table saw for your woodworking projects could be a tedious task. 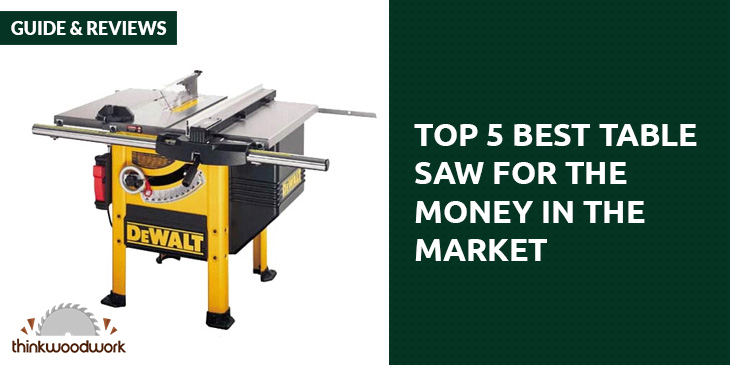 Recently, I had a chance to review a lot of different table saws and I was able to drill down the 5 best best table saw for the money. 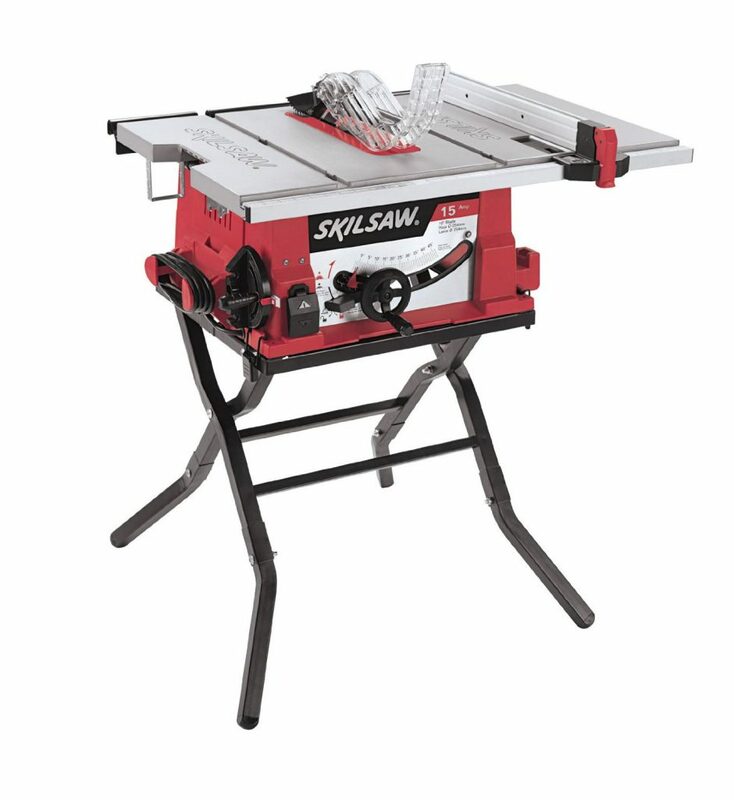 So, let’s jump straight into the 5 best table saws you will get for the money. 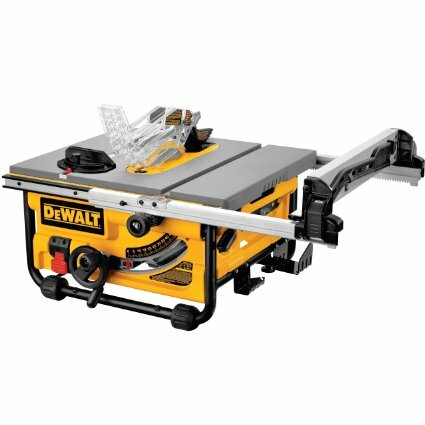 If you are looking for the best table saw under 300 then you simply can’t go wrong with the Dewalt DW745 job-site table saw. Out of all of the table saws I reviewed this is one of the most portable, accurate and durable saws on the market. There’s no denying that the powerful 15-amp high torque motor is powerful enough for nearly any job with its 3,850 rpm no-load speed, and at 45 lbs. The lightweight design makes it very easy for one person to carry anywhere. The tool-free adjustment allows you to adjust the rails up to 20-inches to rip full sheets of wood with ease, and the Modular Guard System protects your hands and fingers making it one of the safest saws you’ll ever use. Want to know about the cutting power? The 10-inch, 24-tooth ﻿﻿Carbide blade cuts through wood like a knife through hot butter while the fence system gives you 610 mm of rip capacity. You get all of these great benefits and more from the quality that only Dewalt can provide by standing behind this table saw with a 90-Day Money Back Guarantee, 1 Year Free Service Contract, and 3-Year Limited Warranty. This is why it is one of the best table saw for the money. 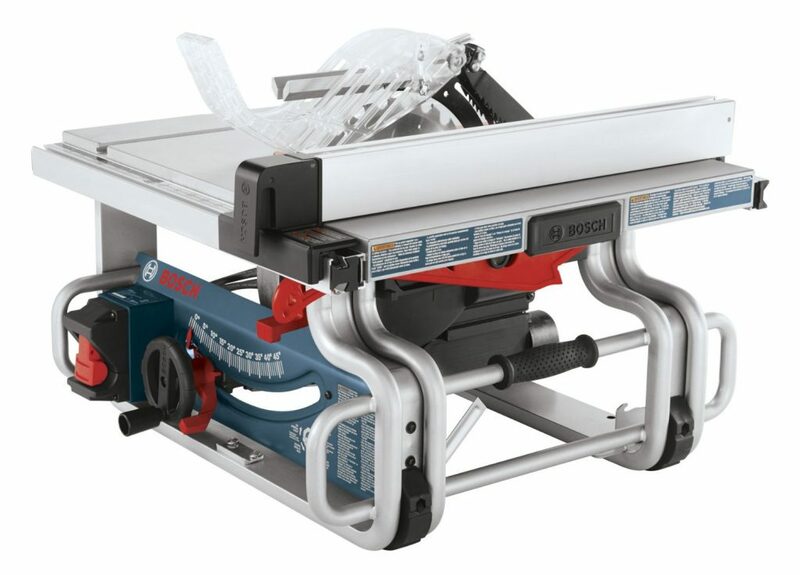 The Bosch 4100-09 Worksite Table Saw is one of the best deals on table saws not only because of the gravity rise stand that makes it easy to cart around but there are several other benefits I noticed as well. For starters, the 29 X 21-1/2 inch tabletop made from machined aluminum gives you a 25-inch rip capacity with an extended 40 width of 40.5 inches allowing you to not only tackle those big projects but the rugged durability ensures you get your money’s worth. Want a table saw with cutting power? Power is no problem for the Bosch 4100-09. With the beefed up 4.0 HP no-load 3,650 RPM motor you’ll have all of the power you need. Not to mention the 10-inch, 40-tooth Carbide blade saw that cuts through wood with ease. Let’s not forge, the Gravity Rise Stand (one of my favorite features) allows you to traverse any terrain to get the job done. All you need to do is wheel this bad boy to your worksite, let the cinch down and start making your cuts, and if at any time you need to move the saw, the 8-inch treaded pneumatic wheels allow you to pick up and go wherever you want whenever you want. 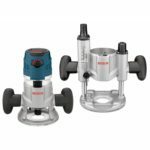 Oh…and did I mention that you’ll be getting all of the quality Bosch provides backed by a 1 Year Manufacture Warranty and 30-Day Money Back Gurantee. Is there any wonder this is on my list as the best table saw for the money this year? 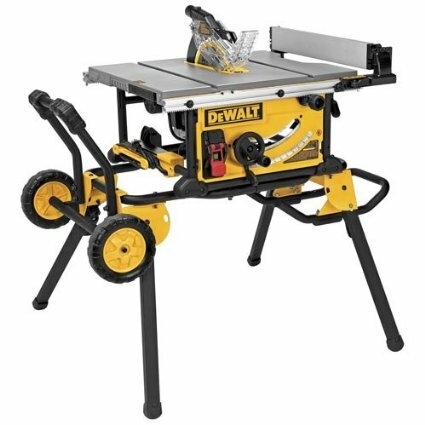 The Dewalt DWE7491RS Jobsite Table Saw is a dream come true for anyone needing to install cabinets, flooring, or trim and its versatility makes it perfect for any remodeling job or even building a deck. This is perhaps the best affordable table saw I’ve reviewed to date because of all of the great benefits that are packed into it. Let’s start with the Rack & Pinion Fence system that makes fence adjustments so fast, easy, and accurate you’ll almost think it was doing it all by itself! ​I also love the 32 ½-inch rip capacity that allows you to cut those larger pieces smoothly and easily. Want to take care of all the dust that would normally be left to clean up? Simply connect a shop vacuum to the 2 ½-inch dust collection port and let the cleanup take care of itself! Use the muscle of the 15-amp motor to quickly rip through any type of hardwood material needed for your project, and the 10-inch cutting diameter will accept a dado blade as long as it’s compatible with the Dewalt DWE7491RS. Let’s not forget about the rolling stand which allows you to transport this 110 pound table saw anywhere you need it and keep it stable enough to make the accurate cuts you are looking for. You get all of these great benefits backed by the Dewalt 3-Year Limited Manufacture Warranty. The Skil 3410-02 Table Saw is the best table saw for the money if you are looking for the best table saw under 300 but you still want plenty of value. What I like most about this Skil table saw is the compact design that is great for saving space in a smaller workshop environment. The sturdy steel frame the saw sits on is plenty strong enough to keep the saw steady while you are running boards across its 20 X 26-inch cast aluminum table (20 X 32-inch extended reach). You will have no problem getting accurate measurements thanks to the self-aligning rip fence and EZ-View measurement system, so you will never have to worry about second guessing yourself. I know you’re probably asking…but what about the motor? Is this thing powerful enough to get the job done? You’ll find plenty of brawn packed into the no-load 5,000 RPM motor and this table saw has great cutting capability with the 10-inch Carbide blade. The only negative I could find about the Skil 3410-02 is…at a weight of 67 lbs. and no option for a stand with wheels…you may need an extra hand to get it setup wherever you are going to use it. Skil will give you 30-days to check out the 3410-02 with folding stand with a money back guarantee, and if you decide to keep it you can rest assured knowing that you are covered by a 1-year warranty. 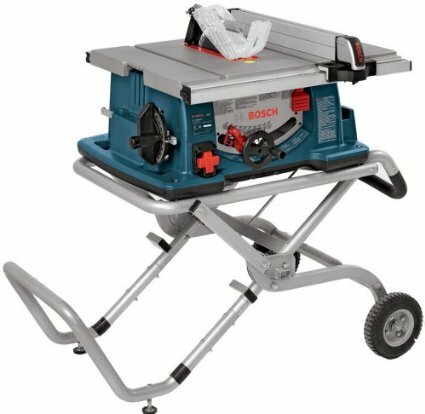 You might think the Bosch GTS1031 is the best cheap table saw because of its portability and you are absolutely correct, but there is so much more to love about this jobsite table saw. The all-steel lightweight base provides plenty of durability to stand up to any abuse your jobsite can throw at it. With a 24-tooth Carbide blade backed by a 2.2HP motor, you will have no trouble ripping through the wood needed for your job. Is safety on the jobsite important to you? If so, then you are really going to love the Smart Guard System that pops on and off in seconds ensuring that hands and fingers stay safe and cuts get done quicker while maintaining control over the material that is being cut. One benefit I really like is the on-board storage drawer that will ensure you never lose the SquareLock rip fence, Smart Guard System, miter gauge, push stick, wrenches and other tools you need to keep safe when hauling your saw to and from the jobsite. The only complaint I have about this saw is that it really isn’t ideal for doing finish work. It has a fast, aggressive start and tends to cut a little too rough for a finish carpenter. Other than that, it gets the job done and can really take a licking! It is easy to see why any one of these saws is the best table saw for the money depending on the type of job you need to get done. Whether you are looking for the best value table saw for your home projects or you are looking for one that will stand up to rigorous jobsite abuse, these table saws pack plenty of punch without breaking the bank.